Now available from John Morris Scientific, the LI-COR LI-820 single path, dual wavelength, non-dispersive infrared CO2 gas analyser is used for monitoring CO2 levels in a range of environmental conditions including ocean science, plant science, geological monitoring and greenhouse control systems. With the LI-820 CO2 gas analyser, CO2 is measured by the absorption of infrared energy as it travels through the optical path. The optical path is a thermostatically controlled infrared detection system which provides stability over both time and temperature, extending the required interval between calibrations. User defined high and low level alarms are available as voltage outputs, allowing the user to control CO2 within a desired range. Relays can trigger devices such as automatic diallers, alarms, pumps and valves in industrial environments. 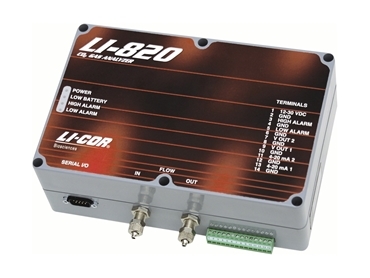 The LI-820 CO2 gas analyser package includes simple Windows interface software for user calibration and data collection. Users can easily set operational parameters and logging options, as well as output data to a printable chart.